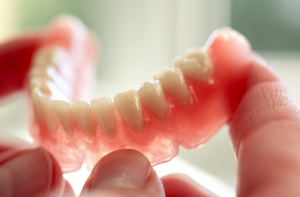 For seniors who are missing teeth, dentures are often considered the standard treatment. However, for many patients, dental implants are a much more convenient and preferable option. Dental implants are a permanent solution for missing teeth, and there are many benefits to choosing dental implants over dentures. Though dentures are often used to replace seniors’ missing teeth and enable them to eat again, there are many limitations that come with wearing dentures. People with dentures are encouraged to avoid chewing hard, crunchy foods. Foods such as peanut brittle, hard candy, and raw vegetables are off-limits to those with dentures. Patients who wear dentures also often need to cut food into bite-sized pieces rather than being able to bite into the food. Denture wearers also need to avoid sticky foods that can damage their dentures. Chewing gum, taffy, and other sticky treats are “out” for people with dentures. Seniors who use dentures may also worry that their dentures will slip while they are eating. This situation not only makes it difficult for the wearer to chew thoroughly, but it can also be very embarrassing. Many patients find these limitations and rules inconvenient and disappointing. For these people, dental implants are often a better solution. Dental Implants: Eat What You Want! Patients who wear dentures need to be conscious of what they are eating at all times, taking care not to damage their dentures. Dental implants, on the other hand, give patients the freedom to eat whatever foods they like. Dental implants are as strong as natural teeth. Unlike dentures, dental implants are able to withstand the pressure that comes with eating certain foods. With dental implants, patients no longer have to worry about damaging their dentures or whether they will be able to handle their favorite foods. Dental implants allow patients to return to a normal lifestyle and give them the peace of mind to eat without worry. There is no risk of the implants slipping out during a meal or during conversation. Dental implants give patients the confidence to enjoy their meals. Dr. Riaz Rayek provides dental implants for seniors so they can enjoy full functionality of their smiles. Dr. Riaz Rayek has been placing dental implants since the beginning of his career. His mentor was one of the pioneers of implant dentistry, whom he studied under for three years. In the last decade, he has completed more than a thousand hours in restorative and implant dentistry advanced education programs. Patients can trust Dr. Rayek to provide them with dental implants that will serve them well for the rest of their lives. If you are a senior in the Fairfax, VA area who wears dentures, or if you have a loved one in this situation, know that there is an option that will enable you to once again eat the foods you enjoy. Dental implants are an excellent solution to restore patients’ ability to eat, speak, and smile. Contact our office today to learn more about your options for replacing missing teeth with dental implants.